Maybe it's in response to the especially hostile political environment, but this is proving a fertile time in the indie circuit for gay teen dramas. 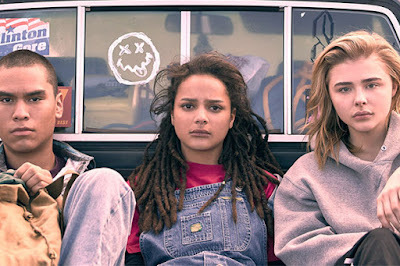 This past Sundance saw the debut of The Miseducation of Cameron Post, the sophomore effort by Iranian director Desiree Akhavan, who made a splashy debut at the festival in 2014 with Appropriate Behavior. Choosing to stick behind the camera this time rather than pulling double-duty, Akhavan passes the starring role to Chloe Grace Moretz who, along with her co-stars, tells an emotional if slightly unsatisfying coming-of-age story. Set in 1993 and based on the book by Emily M. Danforth, The Miseducation of Cameron Post tackles the subject of gay conversation therapy, a hot-button issue that will be seen again later this year in Joel Edgerton's Boy Erased. Moretz, who seems to jump between adult roles and teen with ease, plays Cameron, who is caught making out with her girlfriend during Homecoming. That's not going to fly in the small town in which she was raised, so Cam's aunt (Ruth Butler) sends her away to a highly-religious gay conversion center in an undisclosed location. In Danforth's book it's Montana and the woodsy locale suggests it's the same in the movie. This isn't one of those stories where the rehabilitation is akin to a prison sentence; there are no over-the-top violent or abusive therapists here. Instead it's shame that is the most powerful deterrent from anybody leaving. Everyone actually has the ability to depart the facility anytime they want, but the point Akhavan and co-writer Cecilia Frugiuele repeatedly assert in subtle ways is that nobody has anywhere else to go. This goes for both the patients and the therapists, too. Cameron quickly makes friends with Jane Fonda (American Honey's Sasha Lane), whose parents were hippies, and Adam Red Eagle (The Revenant's Forrest Goodluck), a Native American who says his spirit is divided between male and female. While the trio can see how bogus this treatment really is, they must still contend with the facility's severe administrator Dr. Lydia Marsh (Jennifer Ehle) and her younger brother, Reverend Rick Marsh (John Gallagher Jr.), who claims to have defeated his homosexual impulses. Cameron's story is told partially in flashback, yet her past remains pretty foggy. In the novel there is more of an emphasis on her parents, and the reason she ends up staying with an aunt. Most of that is removed in the film, and other than a fleeting desire to reconnect with her past love Cameron's journey isn't all that compelling. At least not compared to those of the people around her. Jane is a survivor doing what she needs to get by, while Adam has a fiercely masculine culture to cope with. Tony nominee Emily Skeggs also provides some nuanced work as Cameron's roommate, whose fervor hides some deep-rooted conflicts. Owen Campbell shines as a young man deemed too feminine to be part of his own family. While you keep hoping for Cameron's story to be fleshed out, it's hard to dismiss the times when she, Adam, and Jane are just hanging out. Whether it's hiking, smoking weed, or jamming out to 4 Non Blondes (Hey, it's the '90s remember? ), the times they spend just kicking it and talking about how messed up therapy is are the film's best moments. Moretz gives a genuinely strong performance capturing the constant push/pull of Cameron's desires with the reality of her situation. There's a lot more story that could have been told, and so much about The Miseducation of Cameron Post is done well that you wish Akhavan had taken the time to tell it.